In Silvania, one and a half hours from Bogota, Francisco Tamayo is working to make Finca La Primavera a model for sustainable coffee farming in Colombia. Francisco’s family arrived to Silvania in 1976 when coffee was already planted on the fam, which his grandparents continued to cultivate. Land near Bogota is increasingly being used for recreation rather than agriculture, but Cundinamarca was a major coffee producer before the regions that currently dominate production rose to prominence. In the 1980’s, there was an economic crisis in Colombia that led to a crisis in coffee prices and Francisco’s family gave up coffee farming in favor of raising beef cattle and pigs. Francisco’s background is in electrical engineering and he received a scholarship to study robotic automation in Japan, where he traveled around the country visiting factories and learning about technologies for automated optic recognition. He worked with optic sorters used in manufacturing (quality control for a pallet of soda bottles, ensuring that all caps are sealed and labels correctly affixed, for example), not knowing that soon he would see and employ those same technologies in coffee. In 2012, Francisco returned to Colombia and began the process of converting his family’s property back into a coffee farm, this time producing organic coffee. The farm’s previous use as a cattle ranch had both pros and cons. Herds compact the soil and the ground was free from agrochemicals, meaning the soil is not contaminated and ready for conversion to organic agriculture. On the other hand, the soil was worn out and lacking nutrients. Cattle scrape off layers of soil as they graze, leading to erosion, and this left a high concentration of toxic metals, like aluminum, in the top layer of soil. Excess aluminum in the soil makes it difficult for plants to absorb nutrients; after several soil analyses Francisco and his team developed a fertilization plan to restore the soil to prepare the terrain to adequately feed the new coffee trees planted. Finca La Primavera is taking extra steps beyond organic production to also become verified Bird Friendly. Representatives from the Smithsonian Migratory Bird Institute in Washington, DC, who manage the certification’s regulations, visited the farm to give recommendations. They saw La Primavera as a prime example of ecosystem restoration. La Primavera has planted more than one thousand trees of various native species to act as both shade for the coffee and habitats for birds and small mammals. Francisco describes La Primavera’s philosophy through the farm’s motto: sustainable, fair, and positive. “Sustainable because of our work with the natural environment and being Rainforest Alliance certified, for our farm’s biodiversity and the natural reserve we have, for farming organically, including raising bees to promote pollination. Fair because we help our neighbors. We don’t just support the pickers and their families, rather we are part of an ecosystem of farms and producers who work together in our efforts towards quality coffee and environmental stewardship. Francisco has a roasted coffee brand in Colombia called Cosecha Real, the royal harvest. Coffee has been integral to the economic development of the Cundiamarca department for more than a century. The area’s coffee is not just a crop; it is part of the social and cultural fabric of the region. Cundiamarca’s coffee grows on the western slopes of the Eastern Andes range of Colombia. Here, coffee cultivations are notable for their biodiversity, integration into local ecosystems, and the commitment of the department’s coffee producers; these ingredients have contributed to the prevalence of shade coffee in Cundinamarca. Below a layer of native Andean flora, shade-grown coffee demonstrates the regional philosophy of conservation and environmental sustainability. Cundianmarca’s coffee farms are planted across more than 43,000 hectares, 70% of which are sown beneath other tree species. 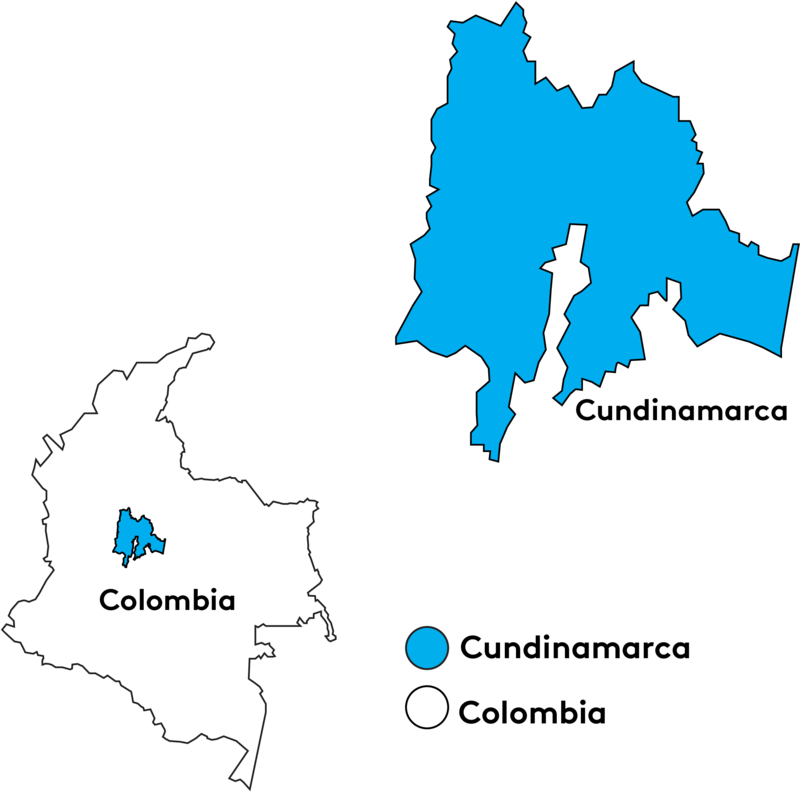 The department surrounds the country’s capital city of Bogota, with its more than 10 million inhabitants in the city and sprwaling metro area. Even though Cundinamarca’s farms are in such proximity to the country’s urban hub, they offer the contrast of aggressively preserving Colombia’s naturally diverse ecosystems.